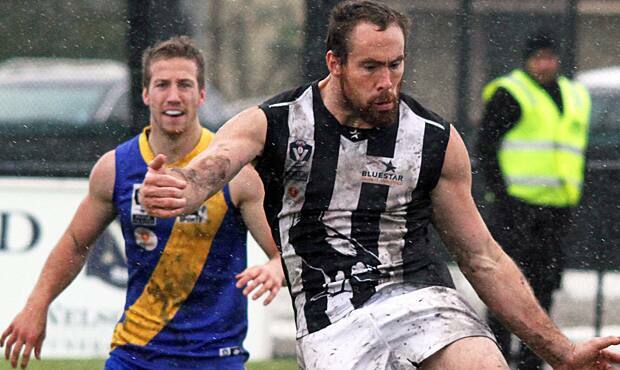 Ben Hudson thumps Collingwood inside 50 during Sunday's loss to Williamstown at Point Gellibrand. Photo: Shane Barrie. A fast-finishing Williamstown (14.9. 97) ran over the top of Collingwood (10.10. 70) to record a 27-point victory in round five of the VFL on Sunday. The Magpies were kept scoreless in the final term while Williamstown piled on eight straight goals to deny the Pies their fourth straight win. As can be expected at Point Gellibrand, the Williamstown weather played a major role in proceedings, with windy conditions favouring the Seagulls in the final term. However, earlier in the day it was the Magpies who best managed the tough environment. With 12 AFL-listed players taking the field, the likes of Nathan Brown, Paul Seedsman and Patrick Karnezis caught Williamstown off guard as the Pies jumped to a 39-point lead at quarter time. Kyle Martin went about proving his six-goal performance against Essendon last week wasn’t a once-off as he kicked the Magpies third goal after majors to Lachlan Howe and Tony Armstrong. As the heavens opened in the second term, so did the Williamstown scoring account. A Sean Tighe free kick led to three goals in a row for the Seagulls as they looked to capitalise on kicking with a strong breeze. While the gap had narrowed, a second goal to Howe and another to Jake Williams ensured that Collingwood was more than holding its own as the players retreated to the sanctuary of the change rooms at half time. After successfully completing their return games last week, Paul Seedsman and Tim Broomhead both left their mark on Sunday's game. Broomhead was one of three Collingwood goalkickers in the third term as the Magpies once again kicked with the breeze. In the absence of Quinten Lynch, Ben Hudson stood strong in the ruck and with the help of Nick Gray, the Magpies gained ascendancy in the middle of the ground to hold a 27-point lead at the final change. Despite the margin, the mood at Point Gellibrand was a nervous one. As the scoring patterns showed, the majority of the game was taking place at the city end in which Williamstown would kick to in the final term. After a relatively quiet game at centre half forward, Patrick Karnezis was shifted deep into defence as the Magpies coaching staff threw extra resources behind the ball. It wasn't though, unfortunately, with the backline constantly put to the test with a number of Williamstown attacks. The Seagulls took the lead for the first time in the match at the 16-minute mark of the final term and didn’t look back, pilling on four more goals to remove any chance of a Collingwood fightback. With the post-match words of Dale Tapping no doubt ringing in its ears, the side will be given an extra week reflect on the loss, with the VFL bye aligning with that of the senior side next week. When the side returns to Victoria Park in two weeks time to take on Bendigo, expect a determined performance from a side desperate to avoid a replica of Sunday’s 27-point loss.